Success against the Romans - their heaviest ever defeat. In 62 BC Pompey, having organised Rome's eastern conquests, returned to Italy, with 40,000 men and 20,000 talents. He immediately disbanded his army, and waited for the senate to invite him to become supreme leader, or dictator, or at least show him some love and gratitude - they didn't. By dismissing his army, he'd broken the first rule of the wannabe dictator, and handed the advantage to his arch rival, Marcus Licinius Crassus - of whom much more quite soon. 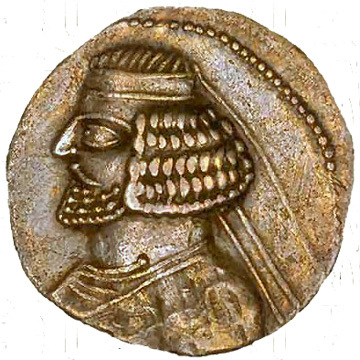 In 57 BC, Farhad III's reign ended in a coup by his sons., leaving two sons. Orodes,the elder, became king - but was soon forcibly deposed by his brother Mehrdad. Orodes (55 BC) went for help to Gabinius, the scoundrel who Pompey had left in charge of Syria. Once again a Roman cheated a Parthian. Gabinius promised to help Orodes - until he got a better offer. The Macedonian pharaoh of Egypt, Ptolemy XII, had already paid Pompey a lot of money to help him get back the throne of Egypt, which his father had left in his will to Rome. Now he made Gabinius an offer he couldn't refuse: 10,000 talents to get him back to Egypt. Gabinius quickly lost interest in Parthia. Surenas was no ordinary person; but in fortune, family and honour, the first after the king; and in point of courage and capacity, as well as in size and beauty, superior to the Parthians of his time. If he went only upon an excursion into the country, he had a thousand camels to carry his baggage, and two hundred carriages for his concubines. He was attended by a thousand heavy-armed horse, and many more of the light-armed rode before him. Indeed, his vassals and slaves made up a body of cavalry little less than ten thousand. The Parthians had always had two main weapons: the aristocracy fought in heavy armour with lances from well-armoured horses; their retainers fought on horseback, armed with bow and arrow, with no armour. But once they'd shot all their arrows off, they were no use. Suren was the military genius who revolutionised the way the Parthians fought. His personal 10,000 horse-archers became the striking force, as a result of an obvious innovation: he kept 1000 camels in the rear with a fresh supply of arrows - the horsemen fired off their quiverful, and went back to the camels for re-up. Simple. Unlimited ammunition helped perfect their basic cavalry tactics. They would gallop at speed at the enemy, then turn their horses round. The archers, spinning round in their saddles, fired their arrows as they appeared to retreat. They would be far away by the time the arrows hit their target. "We had no reason to go to war"
But Crassus pressed ahead with raising troops, and marched out from Rome in November 55 BC. He ignored all advice, and the many omens which foretold disaster. He arrived in Syria in spring 54 BC to take over from Gabinius. He had a force of about 44,000, including 1000 elite cavalrymen under the command of his son Publius Crassus. He knew he'd need more cavalry - it would be supplied by local Arab allies and (he hoped) by Armenia. He crossed the Euphrates to show his intent, but didn't attack Seleuceia (where Mehrdad was still holding out against his brother Orodes). He went back to Syria for the winter, during which he used his army for some personal plundering raids on temples as far away as Jerusalem. What he didn't do was get any intelligence on Suren's army, or give his men appropriate training. He knew how easily Armenia had crumpled faced with Pompey - no doubt he thought the Parthians too would be a pushover for a Roman army. By the spring of 53 BC, Orodes had killed off his brother, and was full of confidence. He decided to invade Armenia himself, while Suren defended Mesopotamia against Crassus. 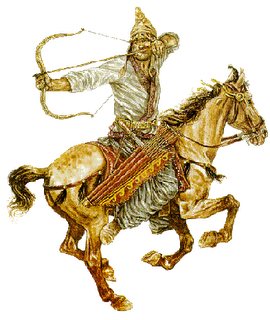 Suren's force was small - just his 10,000 horse-archers, plus 1000 heavily-armed cavalrymen. Crassus crossed the Euphrates during a violent storm - not a good omen. His Arab cavalry was with him, but the Armenian force didn't appear - being busy dealing with Orodes' invasion. His target was Seleuceia. The Arabs were taking him there by a less-known route through the desert. His men were soon tired, hungry and thirsty. They camped by the river Belik. Suren had been waiting for them. As soon as Crassus started to move out, he attacked. The Arab cavalry immediately headed for home. When they got close to the Romans, and their commander gave the signal, first they filled the plain with the sound of a deep and terrifying roar. The Parthians do not stir themselves up for battle with trumpets, but they have large drums with bells attached. The noise of these drums on all sides produces a sound like a combination of animals roaring and thunder. After a heavy cavalry charge softened them up, the horse archers began their assault. The Romans now saw the velocity and force of the arrows, which fractured armour, and tore their way through every covering, whether hard or soft... The enemy were so rapid in their movements, it was impossible to overtake them. Their arrows sped faster than light could follow, and penetrated every kind of defence ... For a time, the Romans hoped the enemy would run out of arrows, and have to stop fighting; but when they saw that many camels laden with arrows had arrived, from which the Parthians took a fresh supply ... Crassus began to lose heart. He told his son to charge the enemy, to give himself a chance to complete the square. But Publius got himself surrounded by the cataphracts, and his men were massacred. 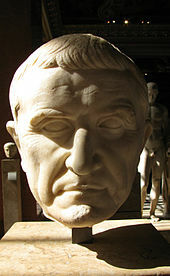 The first Crassus knew was when he saw his son's head being paraded on a spear. His army fought on bravely until dark - they left their 4000 wounded and headed for the nearby town of Carrhae. But that wasn't safe. A local man offered to guide them during the night to a better place. But the guide was pro-Parthian, and led them on a wild-goose chase. By dawn the Roman army was a mess. His second-in-command deserted. Morale was rock bottom. But Suren didn't attack. Instead, he came to Crassus and offered a deal if he left in peace. Crassus was to go off alone with Suren to sign. But as he was getting on to his horse, some of the Romans thought it was a trap. What began as a scuffle turned into a fight. All of them, including Crassus, were killed. The precious eagles, standards of 3 Roman legions, were captured and taken in triumph to Seleuceia. Half the invading force, about 22,000 men, had been killed. Another 10,000 were taken prisoner and taken to the eastern frontier of the Parthian empire to act as frontier guards. The Parthians had been outnumbered four to one - it was a tremendous victory. And so the tragedy of Crassus ended in farce. Crassus' ambitions end in disaster when he comes up against the Parthian horse-archers trained by Surenas at the Battle of Carrhae 53 BC. 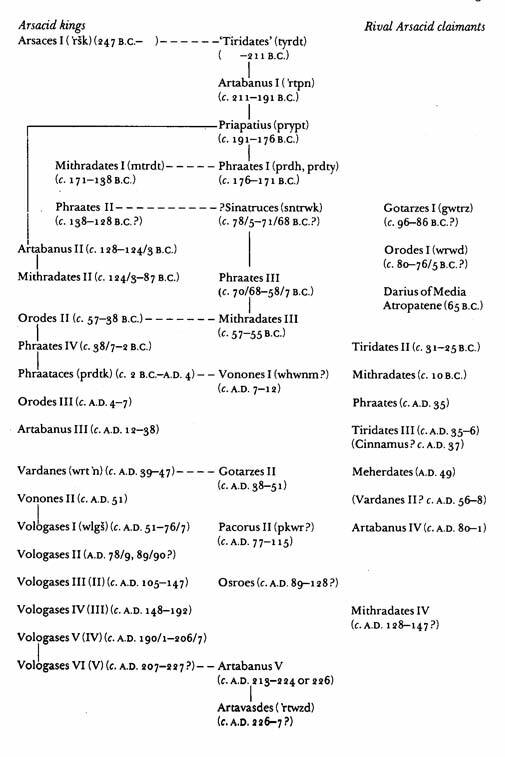 Key to The Arsacid dynasty(from Malcolm Colledge, Parthian Art). Dotted lines indicate succession between brothers (blood or adopted). The Roman senate was a body of elderly and conservative landowners whose approval was traditionally thought to be necessary for any measures taken by the Roman republic. During the last 100 years or so, powerful individuals had increasingly questioned the senate's authority. Pompey and Crassus had both done so in the past - and were soon to be joined by a third ambitious individual, Gaius Julius Caesar. None of the three could get the senate to approve what they wanted - so in 55 BC they formed a secret conspiracy (known to history as the First Triumvirate) to get their own way by whatever means necessary. ... or Surena or Surenas was the name of one of the leading families of Parthia - we don't know the personal name of this one. 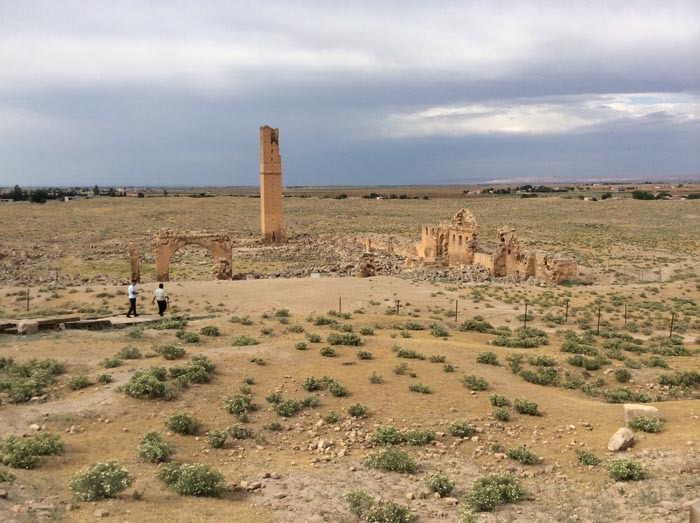 The family stayed important right through the Parthian and Sasanian periods - last heard of in the 9th century AD in China. Caesar was in Gaul, and was able this very year to send back exciting reports of his first visit to the exotic and legendary island of Britannia. Pompey had had a brilliant military career, climaxing in his defeat of Mithridates VI of Pontus. Crassus had been responsible long ago for putting an end to the slave rebellion of Spartacus (71 BC), but even here Pompey had stolen much of his glory. The 60-year old decided it was time to show what he could do. These were from Gaul, a present from Caesar, under whom Crassus' son Publius had served with distinction. They were Crassus' best troops. These were the famous cataphracts - of whom much more will be heard. Picture them as something like medieval European knights. The reliability of Plutarch (Greek historian c. AD 42 - 120) depends on who he's using as a source. For the Battle of Carrhae it appears to have been a reliable eyewitness. For once in a description of an ancient battle, you can actual understand what was going on. This was Cassius, later famous/notorious as one of the prime movers of the plot to assassinate Julius Caesar in 44 BC. There's an intriguing suggestion that some of these Roman legionaries may have ended up in China - enlisted by Chen Tang for his battle against the Xiongnu in 36 BC, and allowed to found a city. (A Roman City in Ancient China by Homer H Dubs in Greece and Rome 1957). Now mainly rejected. ?In this Greek tragedy, Agave, in a mad fit, has, with her friends, hunted down, killed and torn to pieces what she believes is a lion cub. She enters in triumph, carrying its head, as she thinks. But she is about to find out that it's the head of her son, Pentheus. 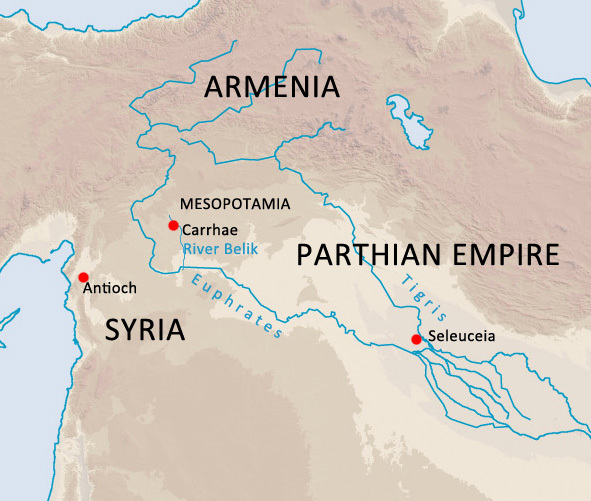 ...was the Parthian governor of Mesopotamia. He'd not been able to stop Crassus when he first crossed the Euphrates in 54 BC. 'Ignoring cautionary advice from his generals, Crassus led his army deep into the wastes of western Iraq. A local chieftain, secretly working for Parthia, assured Crassus he would be greeted as a liberator, and the Parthian army would flee.